Welcome to the new Lesbians 101 site! We hope everyone has enjoyed the lessons so far! And we’re happy to announce that Lesbians 101 is now in print! A 16-page, full-colored magazine-sized, inclusive edu-comic for EVERYONE to enjoy is here to stay! We sold out of the original Lesbians 101 print-run at ECCC in Seattle this year, but you can nab your very own copy HERE! And if you want a .PDF of all the current pages (some that will only be published in comic form!) you can nab that HERE! Click Here to Pre-Order Lesbians 101! Until then, if you have any site kinks, musings, or just want to drop us a line, you can always e-mail us! And if you want to hear more (insider) news about the 101 Series, our Patreon is booming with exclusive .PDFs, lessons and all sorts of tidbits! Enjoy! 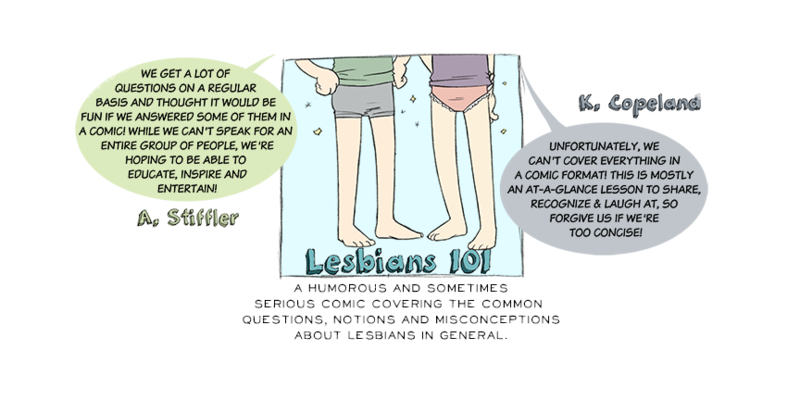 Thanks for reading Lesbians 101! We’ll have more to share soon!